With the summer holidays just around the corner, we will all be encouraging our children to spend more time outside in the garden. There are so many digital disruptions these days that it is important to get outside and enjoy the nicer weather while we can! However, before sending young children outside it is important that you child proof your garden in the same way that you would inside your home. To give you complete peace of mind while your child is playing out in the garden this summer, here are some simple and easy tips that you can carry out in your garden to ensure that it is child-proof. If you are going to be renovating your garden before summer, you may be thinking about adding a lovely water feature to it. While water features look fantastic in your garden, they are not the most child-friendly options and if you already have one in your garden we would suggest having it covered up for the time being. Very young children will love a small water feature such as a pond but if you are going to be leaving them outside then it is not entirely safe. As they get older, you can reintroduce the water feature to teach them more about nature. If you live in a climate that is warm enough for a swimming pool, we would also recommend covering this too for the time being and getting the paddling pool out instead! 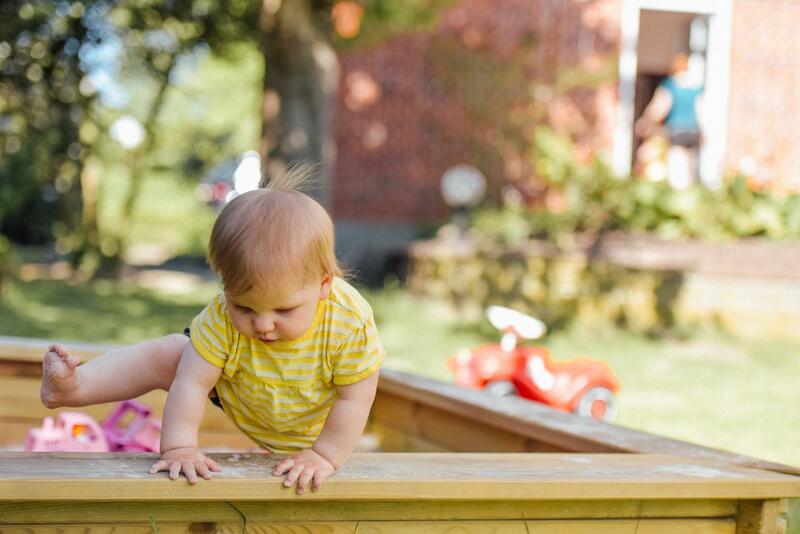 When it comes to child proofing your garden, another crucial step is to make sure that the surfaces are all child friendly. For example, hard paving requires less maintenance but it is not particularly good for children as this can contribute to an endless supply of tears and scuffed knees. We would recommend using lawn for the majority of your garden as this is the best option when there are lots of tumbles happening. Sand area and wood chips are also great options too and so if you have gravel areas it is a good idea to substitute this out for one of these options. What’s more, we would also suggest avoiding decking too as this can become very slippery when the rain falls. However, if you do really like the look of decking, you can invest in anti-slip decking instead. Sometimes living in the UK, we forget that the sun here can still be very warm and potentially damaging to our health, with many people only taking breaks from the sun and slapping on the sunscreen when on holiday abroad. However, it is important that you take this into consideration when child proofing your garden. Most likely your young child will be outside playing on days when it is warm and sunny and so you should ensure that there is an area of the garden which is shaded and where kids can take a break from the sun. Put some outdoor furniture in this shaded area to encourage the children to take a seat away from the glaring UV rays. If you are trying to keep your garden well-maintained and tidy, no doubt you will have a lot of gardening tools and chemicals lying around such as lawn mowers, rakes, grass trimmers and pesticides. When child proofing your garden, it is important that you invest in great wooden sheds where you can store and lock away these items to stop little fingers getting their hands on them and causing serious harm to themselves. If you don’t have the time to drive out to a store, wooden sheds can be found online at great, affordable prices and in a variety of styles. Not only will you be keeping the little ones safe, you will also have a fantastic new investment in your garden. When you are carrying out any maintenance in your garden, ensure that you don’t leave out any of these tools and that they are completely locked away as it only takes a few minutes for a child to cause serious harm with them. Does your garden have fencing? If not, then this is something that you will definitely want to consider putting in before you allow your child outside to play. A fence will ensure that your young child stays in the back garden and cannot make their out towards the street which could be very dangerous. Fencing also needs to be maintained too, so make sure there are no broken pieces that a child could injure themselves on or slip out through. Before sending your child out into the garden, you will want to ensure that all plants are safe and are not going accidentally harm any children. A great example here is roses. Roses look beautiful in gardens, however, they may be something that you have to remove for the moment and grow back again at a future date as the thorns on them can cause some very bad scratches in a young toddler. Furthermore, any plant which looks like it has edible berries on it should also be removed as curious young children will be tempted to pick and eat these when they can be very poisonous to humans. While you may think that you have completely child-proofed your garden, it is important that you are constantly monitoring your outside space as there are normally always areas that you can invest in. For example, is your fencing becoming broken with jagged panels? Or maybe you have a broken window on your shed? This is all general maintenance works that needs to be kept up to date to ensure that your garden is child proof. This summer, if you want to child proof your garden make sure you follow each of these steps to give you complete peace of mind.